1) Find the class mark of each interval by taking the average of the upper and lower limits. For example, the class mark of the interval 10 < 20 is (20+10)/2 = 15. 3) Enter the data points using matrices. Enter the products in one matrix and the frequencies in another matrix. 4) Note that the mean of a grouped data set is calculated by dividing the sum of the products for each interval by the sum of the frequencies. 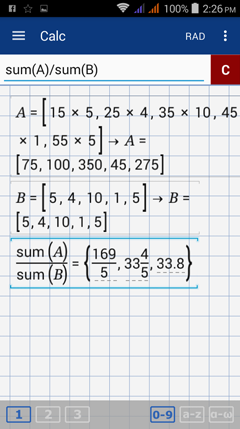 Use the sum function to find the average by entering sum(A)/sum(B). The monthly salaries of 20 selected employees at a company are listed in the frequency distribution table below. What is the average monthly salary of these employees? 1) Find the class mark of each interval. 2) Enter the products of the class mark and number of employees (frequency) in matrix form. 3) Enter the frequencies in matrix form. 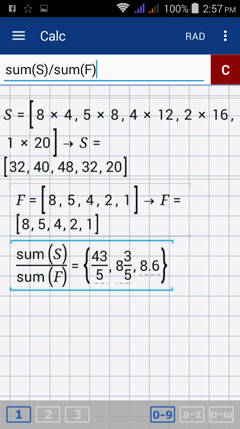 4) Find the average by entering sum (S)/sum (F).